I will be speaking at the yearly DOAG conference in December as well as at the IT Tage in November. My talk will be "Oracle Optimizer System Statistics Update 2018" where I summarize the history and current state of affairs regarding System Statistics and I/O calibration in recent Oracle versions like 12c and 18c. I will be speaking at the DOAG 2018 Exa & Middleware Days in Frankfurt on June 18th and 19th. My talk will be "Exadata & InMemory Real World Performance" where I discuss the different performance improvements you can expect from the super fast scans delivered by those technologies depending on the actual work profile of the SQL and data used. First of all Happy New Year to everyone and I want to thank the numerous people that attended my sessions "Calamities With Cardinalities" at DOAG 2017 and IT Tage 2017 last November and December. You can find the slide deck here at slideshare.net. Stay tuned for more publications this year - at least I have some interesting stuff upcoming. In the last part of this installment I'll have a brief look at the network performance measured in the Oracle DBaaS environment, in particular the network interface that gets used as private interconnect in case of RAC configuration. The network performance could also be relevant when evaluating how to transfer data to the cloud database. Recently I repeated the I/O related tests on a 12.2.0.1 instance for curiosity and was surprised by the fact that I consistently got significantly better results as on 11.2.0.4 and 12.1.0.2. In this second part of this installment I'll focus on the performance figures related to I/O encountered when the corresponding tests were performed on the platform. When running with minimum sized buffer cache, direct and asynchronous I/O enabled, the following average read-only IOPS figures were measured over a period of several days (this is the test described in part three of the "performance consistency" series) . Here is a recording of a session I did a while ago, covering how to understand the essentials of Oracle Parallel Execution and how to read the corresponding execution plans. 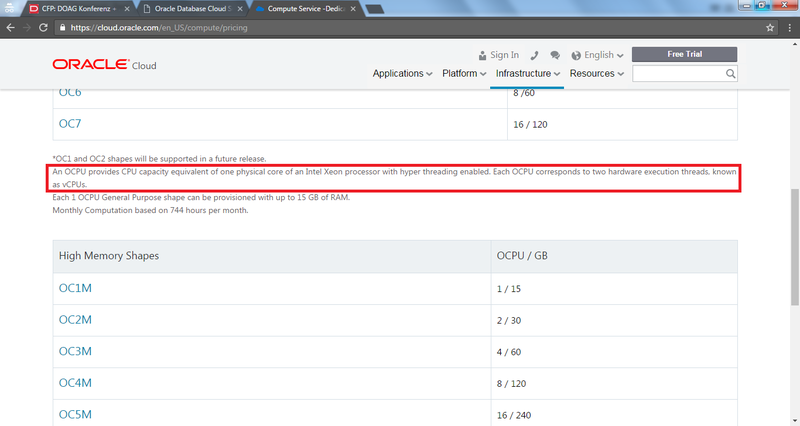 After having looked at the performance consistency provided by the Oracle Database Cloud offering in the previous series, I'll focus here on the raw performance figures I've measured during my tests, starting with the CPU related performance findings. I've recently requested to be removed from the Oracle ACE program and move to the "Alumni" status. I've already felt for a quite a while now that my area of expertise and interest as well as my public profile (no Twitter etc.) is no longer really a good fit to the ACE program. The most recent changes to the ACE program then just have made my decision easier to step back. This part of the series is supposed to cover the results of I/O related tests performed on the Amazon RDS Oracle cloud instance. As mentioned in the previous part of this series I've only used the "General Purpose SSD" storage type since the "Provisioned IOPS" storage was simply to expensive to me and it wasn't possible to get a trial license for that storage type.